Eye opening and increased motor activity after the second postnatal week in rats imply an extensive development of motor control and coordination. We show a parallel developmental change in spontaneous IPSC (sIPSC) kinetics in cerebellar granule neurons. sIPSCs were studied by whole-cell recordings in cerebellar slices, prepared from 7–30 postnatal day old rats. Early in development, sIPSCs had slow decay kinetics whereas in older rats faster decaying sIPSCs were found in larger proportion. Currents elicited by 1 mmGABA pulses (GABACs) in nucleated patches excised from cerebellar granule neurons revealed that GABACs kinetics better approximate sIPSC decay in young but not in more developed rats. The expression of α6 subunit of GABAA receptors, unique in cerebellar granule neurons, has been shown to increase during development. 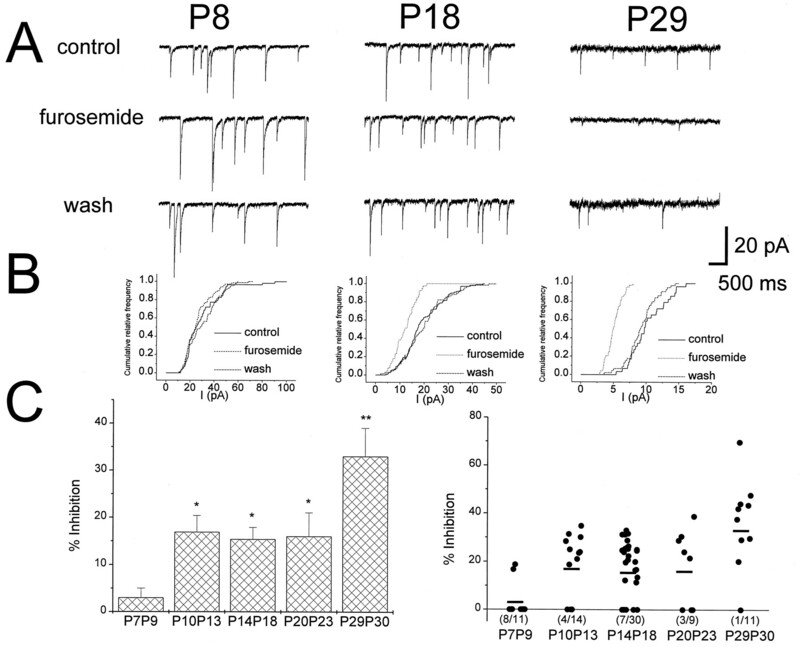 Therefore, we took advantage of the recently reported selective inhibition of GABAA receptors by furosemide to characterize the relative contribution of α6 subunits to native receptors in inhibitory synapses of cerebellar granule neurons. Although furosemide inhibition of sIPSCs amplitude was highly variable among distinct granule cells, it increased during development. 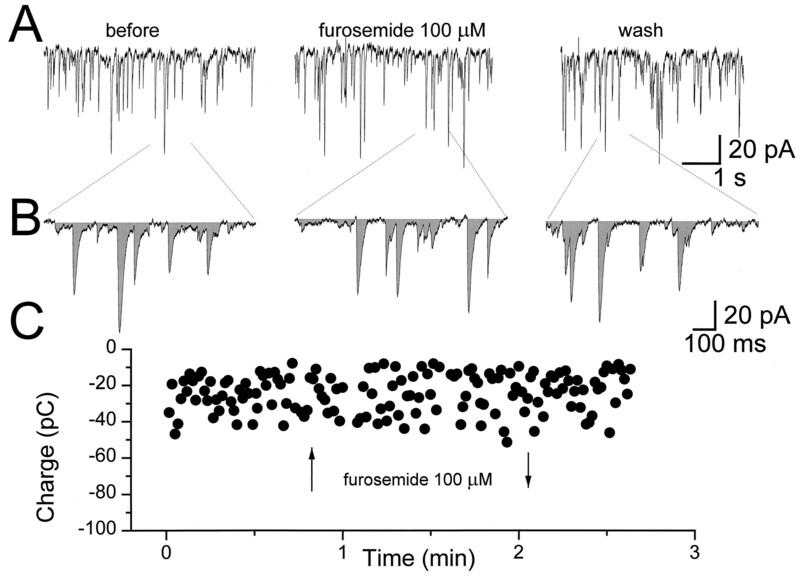 At the same time, furosemide failed to inhibit sIPSCs recorded from Purkinje neurons. From the comparison of furosemide inhibition and kinetics of sIPSCs with GABACs recorded from mammalian HEK293 cells transfected with combinations of α1 and α6 GABAA receptor subunits together with β2γ2 subunits, we propose that an increased α6 subunit contribution in the molecular assembly of postsynaptic receptors in cerebellar glomeruli is responsible for the developmental changes observed. We and others have previously investigated spontaneous IPSCs (sIPSCs) in neurons in rat cerebellar slices (Farrant and Cull-Candy, 1991; Vincent et al., 1992; Maconochie et al., 1994;Puia et al., 1994; Kaneda et al., 1995). To gain further insight into molecular determinants of sIPSCs kinetics, we studied developmental changes occurring at these synapses in rats and compared the results obtained with studies of recombinant GABAAreceptors of defined composition in mammalian transfected cells. Rapid application of brief pulses of GABA to outside-out excised patches generate currents (GABACs) kinetically similar to sIPSCs (Maconochie et al., 1994; Puia et al., 1994; Jones and Westbrook, 1995a). Studies of GABACs from cultured hippocampal neurons suggest that the biexponential decay of these currents is related to the entry in and subsequent exit from a desensitized state (Jones and Westbrook, 1995a). However, the molecular determinants underlying the time constant values of the double-exponential decay and the relative contribution of fast and slow decay components to the peak current are still unknown. In spite of preliminary evidence that receptor phosphorylation may alter GABAC kinetics by affecting desensitization (Jones and Westbrook, 1994; Jones and Westbrook, 1995b), it is not unreasonable to think that kinetic differences could also arise from distinct GABAA receptor isoforms. To this end,Verdoorn (1994) has shown that although complex biexponential kinetics could be observed with a relatively homogenous receptor population, the kinetic properties of GABACs observed were characteristic for distinct GABAA receptor subunits. In situ hybridization studies (Laurie et al., 1992a) and immunocytochemical techniques (Fritschy et al., 1992; Thompson et al., 1992) have shown the selective localization of α6, as well as δ, subunits in cerebellar granule but not in Purkinje cells, although a recent study revealed the transient expression of δ subunits in Purkinje cells of developing rats at postnatal day 10 (P10) (Muller et al., 1994). Furthermore, immunocytochemical studies indicate that both α1 and α6 subunits are present at synapses innervated by type II Golgi cell terminals in granule neuron dendrites (Baude et al., 1992;Nusser et al., 1995, 1996). In the cerebellum, the α1 subunit mRNA is found very early postnatally, whereas the α6 and δ subunit mRNAs could be detected only after P6 and P12, respectively (Laurie et al., 1992b). At later stages, a parallel increase between α1 and α6 subunit mRNAs has been reported between P14 and P21, well after cerebellar granule cell migration, with a peak for both subunits at P21 (Bovolin et al., 1992; Zheng et al., 1993). The mRNAs for these subunits do not differ between P21 as compared to the adult cerebellum, where abundance for the α1 message is double that the α6 mRNA (Bovolin et al., 1992; Zheng et al., 1993). Our aim was to investigate kinetic changes and furosemide sensitivity (Korpi et al., 1995) of GABAA receptor-channels in developing cerebellar granule neurons and to verify whether these changes are related to the relative contributions of α1 or α6 subunits by a comparison with recombinant GABAAreceptors produced by transient transfection of combinations of these subunits. Cerebellar slices. Sagittal slices of cerebellum (150–200 μm) were prepared from 7- to 30-d-old Sprague–Dawley rats as described previously (Puia et al., 1994). Cerebellar neurons were viewed with an upright microscope (UEM, Zeiss, Germany) equipped with Nomarski optics and an electrically insulated water immersion 40× objective with a long working distance (2 mm). cDNA transient transfection. Human embryonic kidney (HEK) 293 cells (American Type Culture Collection, Rockville, MD, ATCC no. CRL1573) were grown in MEM (Gibco, Gaithersburg, MD), supplemented with 10% FBS, 100 U/ml penicillin (Gibco), and 100 U/ml streptomycin (Gibco). Exponentially growing cells were dispersed with trypsin, seeded at 2 × 105 cells/35 mm dish in 1.5 ml of culture medium, and plated on 12 mm glass coverslips (Fisher Scientific, Pittsburgh, PA). Rat α1, β2, and γ2 GABAA receptor subunit cDNAs were each individually subcloned into the expression vector pCDM8 (Invitrogen, San Diego, CA), and the α6 subunit was cloned into the pCIS2 expression vector. HEK 293 cells were transfected using the calcium phosphate precipitation method with various combinations of pCDM8α1, pCIS2α6, pCDM8β2, pCDM8γ2, and pRSV.IL2R containing the cDNA for the Tac subunit of the interleukin 2 receptor. The expression of cDNAs cloned into the pCDM8 and pCIS2 vectors is under the control of the same promoter/enhancer system (cytomegalovirus promoter). The following plasmids combinations were mixed: α1:β2:IL2, α6:β2:IL2, α1:β2:γ2:IL2, α6:β2:γ2:IL2, and α1:α6:β2:γ2:IL2 (4 μg each construct). The coprecipitates were added to the culture dishes containing 1.5 ml of MEM medium and incubated for 12–16 hr at 37°C under 3% CO2. The media was removed, and the cells were rinsed twice with culture media and incubated in the same media for 24 hr at 37°C under 6% CO2. Before recording, cells were incubated with magnetic particles, Dynabeads (Dynal, Lake Success, NY) complexed with anti-interleukin 2 receptor antibody (mouse monoclonal IgG, Upstate Biotechnology, Lake Placid, NY) in the extracellular solution for 20 min at 37°C. Coverslips were mounted onto a recording chamber, and the transfected cells were readily identified by the presence of the beads for the electrophysiological studies. Our studies on recombinant receptors were performed within 3 d after transfection, and data from cells transfected with a given subunit combination were derived from at least three separate transfections. Solutions and drugs. Experiments were performed at room temperature (22–24°C) using an extracellular medium composed of (in mm): NaCl (120), KCl (3.1), K2HPO4 (1.25), NaHCO3 (26), dextrose (5.0), MgCl2 (1.0), CaCl2 (2.0) containing 2 mm kynurenic acid (Aldrich, Milwaukee, WI) to block excitatory amino acid-mediated synaptic transmission. The solution was maintained at pH 7.4 by bubbling with 5% CO2 + 95% O2. The slice was continuously perfused at a rate of 5 ml/min. and completely submerged in a total volume of 500 μl. Furosemide (Aldrich) was dissolved in DMSO (<0.01% final concentration, Sigma, St. Louis, MO), diluted in the extracellular medium, and superfused through a parallel input to the perfusion chamber until effective replacement of the solution was obtained. For fast application of GABA, we used a piezoelectric translator (P-245.30 Stacked Translator, Physik Instrumente, Germany) to quickly move a double-barrel theta tubing placed positioned in front of the excised patch. One barrel of the applicator contained extracellular medium with added TTX (Sigma), and the other with this solution containing 1 mm GABA. After each patch recording, on and off rates as well as pulse duration were measured by “blowing out” the patch and recording currents generated by the liquid junction potential caused by a 50:1 dilution of the GABA-containing solution. The duration of the application was also inferred by measuring the duration of the current generated on outside-out patches and lifted transfected cells by replacing the GABA-containing solution with a solution where NaCl was replaced with KCl in the double-barrel applicator. We observed only minimal differences between outside-out patches, nucleated patches, and transfected cells up to cell diameter of 6 μm in the kinetics of the current produced by pulse applications, with on and off rates of the pulse typically less than 0.2 msec. Larger cells, however, severely slowed down the speed of solution exchange and GABACs were characterized by a much slower rise times. For fast application of GABA with furosemide, we exchange the solutions in the double-barrel pipette by means of solenoid valves connected to tubing linked to a multisyringes infusion pump (model 200, KD Scientific, Boston, MA) that applied the solutions at a constant rate (0.25 ml/min). Furosemide was added in both control and GABA-containing solutions. Electrophysiology. Whole-cell voltage-clamp recordings of sIPSCs and GABACs were made with an Axopatch-1D amplifier (Axon Instruments, Foster City, CA), after capacitance and series resistance compensation. Series resistance was typically less than 15 MΩ and was checked for constancy throughout the experiments. Electrodes were pulled from borosilicate glass capillaries (Wiretrol II, Drummond, Broomall, PA) and were filled with a solution containing (in mm): CsCl (145), EGTA (5.0), MgATP (5.0), and HEPES (10) to pH 7.2 with CsOH. Cs-methanesulfonate (145 mm, Aldrich) was substitute for CsCl for low Cl− experiments. ATP-γ-S (Sigma) in equimolar concentrations replaced ATP in a few experiments. Current traces from whole-cell and outside-out patches were recorded on a VR-10 data storage system (Instrutech, Haverhill, MA). Data analysis. Currents were filtered at 1–2 kHz with an 8-pole low-pass Bessel filter (Frequency Devices, Haverhill, MA), digitized using a PC-compatible microcomputer equipped with a Digidata 1200 data acquisition board (Axon Instruments, Foster City, CA) and Axotape2 (Axon Instruments) software. Off-line data analysis, curve fitting, and figure preparation were performed with Origin (MicroCal Software, Northampton, MA) and pClamp 6.0 (Axon Instruments) software. Peak amplitudes were measured at the absolute maximum of the currents, taking into account the noise of the baseline and noise around the peak. Rise times were measured as the time elapsed from 10 to 90% of the peak amplitude of the response. Curve fitting was performed using simplex algorithm least squares exponential fitting routines with double-exponential equations of the form I(t) = Ifexp(−t/τf) + Isexp(−t/τs), whereIf and Is are the amplitudes of the fast and slow decay components, and τf and τs are their respective decay time constants. For step applications, a constant term describing the steady state was added. Furosemide effects were assessed on averages of 100 sIPSCs in granule neurons by statistical comparisons, and in a few cells a cumulative relative frequency distribution was built. sIPSCs in cerebellar Purkinje cells were analyzed with a semiautomated evaluation of the integral over time of 1 sec interval of activity, representing the total charge crossing the cell membrane in the time interval selected. Averages of multiple evaluations were used to assess more directly the effects of furosemide on sIPSCs in Purkinje cells. Unless otherwise indicated, data are expressed as mean ± SEM; p-values represent the results of independent t tests, with previous ANOVA as appropriate. sIPSCs were studied in rat cerebellar slices by means of whole-cell voltage-clamp recordings from granule and Purkinje neurons, visually identified by their location and morphological characteristics. The average resting potential and input resistance of cerebellar cells were similar to those previously described (Farrant and Cull-Candy, 1991; Vincent et al., 1992; Puia et al., 1994; Kaneda et al., 1995). Whole-cell recordings of sIPSCs from granule and Purkinje neurons voltage clamped at −60 mV were performed using an intracellular pipette solution containing 145 mmCsCl and were observed as inward currents (Figs.1, 2, 3). As previously reported, sIPSCs in Purkinje neurons were larger and more frequent than in granule neurons (Farrant and Cull-Candy, 1991; Vincent et al., 1992;Puia et al., 1994; Kaneda et al., 1995). Capacitance of cerebellar neurons was typically less then 8 pF and did not change significantly with development. 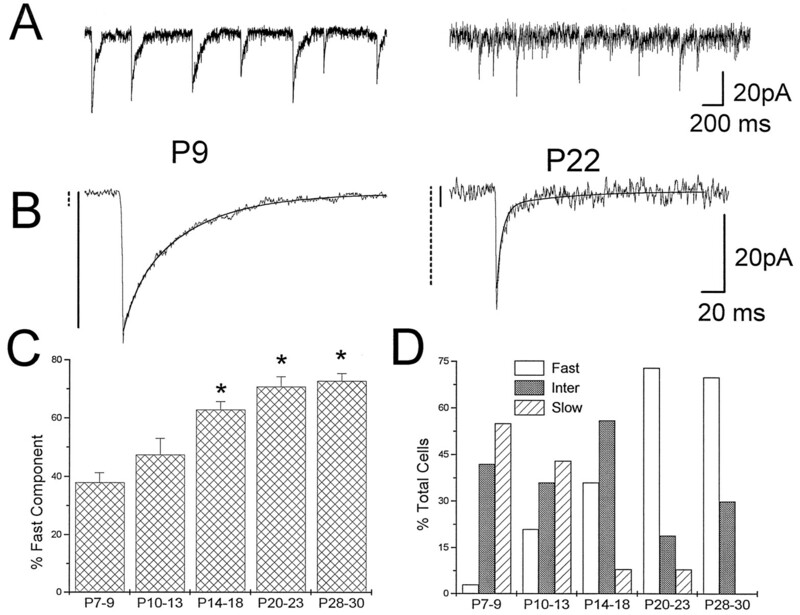 Spontaneous inhibitory postsynaptic currents (sIPSCs) recorded from cerebellar granule neurons at postnatal days 9 and 22. A, Slow-sweep current traces show sIPSCs from a granule neuron at P9 (left) and a granule neuron at P22 (right). The baseline noise is much higher in the cell at P22. B, The average of 20 sIPSCs from each cell is shown, with a double-exponential curve superimposed on the decay phase of the current. The bars to the left of each current represent the fractional contribution of slow (solid bar) and fast (dashed bar) exponential curves to the peak amplitude.C, The fractional contribution to the peak of the average sIPSC of fast decay component is shown for five distinct postnatal age groups. Asterisks indicate statistical significance (p < 0.05) with t test. Data are derived from 34 cells at P7–P9, 17 cells at P10–P13, 39 cells at P14–P18, 28 cells at P20–P23, and 10 cells at P28–P30. D shows the developmental changes in proportion of three major granule cell groups, identified according to the fractional contribution of the fast decay component to the peak sIPSC. The Fast group was characterized by sIPSC decay with more than 70% fractional contribution of the fast decay component, the Slow group by less than 40%, and the intermediate group (Inter) comprises all other cells. Furosemide affects sIPSCs recorded from granule neurons in cerebellar slices. A shows current traces representative of sIPSCs recorded from cerebellar granule neurons at three postnatal ages, P8, P18, and P29, as indicated. The middle traces in each panel are segments of recordings of sIPSCs after 1 min bath perfusion with furosemide (100 μm) followed by 5 min of washout (bottom traces). B, The cumulative relative frequency of the sIPSCs shown in Ais shown for control, furosemide treatment, and washout at the three postnatal days considered. C, The percent inhibition of the sIPSCs produced by 100 μm furosemide is shown for five distinct age groups. Peak amplitude of 100 sIPSCs was measured before, during, and after furosemide bath perfusion. A statistical comparison (t test) was performed between the means of the three groups with p < 0.05 to determine significant reductions. In the left panel, the averages ± SEM are shown. *, Statistical significance with respect to the age group P7 to P9 (p < 0.05 ANOVA followed by t test); **, statistical significance with respect to all the other age groups (p < 0.05 ANOVA followed by t test). In theright panel, the percent inhibition of peak sIPSCs in each granule cell studied is shown. Data points on the abscissa are cells in which the furosemide did not statistically decrease peak sIPSCs. Furosemide does not affect sIPSCs recorded from Purkinje neurons in cerebellar slices. Whole-cell recordings were performed at −60 mV holding potential with a symmetrical Cl− solution. In A current traces show sIPSCs recorded from Purkinje neurons in cerebellar slices at P14 before (left), during (middle), and after (right) bath perfusion with furosemide (100 μm). Dashed lines indicate selected segments of 1 sec duration shown in B, with a shaded area representing the integral of the synaptic current (charge transfer). In C is shown the effect of furosemide application (arrows) on the charge transfer evaluated in individual 1 sec current segments. We investigated in detail the characteristics of sIPSCs in developing granule neurons in the postnatal age range from P7 to P30. sIPSC occurrence was observed in most granule neurons in the early postnatal age (P7–P14), whereas after P27 most neurons did not possess sIPSCs. Our first striking observation was an increase in the baseline noise in whole-cell recordings from older granule neurons as can be observed in Figure 1A. Because a tonic activation of GABA receptors in cerebellar granule neurons in slices from developing rats (P7–P20) has been reported (Kaneda et al., 1995), we considered the possibility that the ambient neurotransmitter concentration in slices from older animals may increase. We therefore measured the extent of the outward current produced in granule cells voltage clamped at −60 mV by the application of bicuculline (5 μm) at different postnatal days. At P14 bicuculline produced an average outward current of 7 ± 1.3 pA (n = 7), whereas at P29 the average current doubled to 14 ± 2.4 pA (n = 4 cells). In contrast, the peak amplitude of the average of 50–100 sIPSCs recorded in each neuron at different postnatal ages decreased with development from an average of 57 ± 8 pA (n = 32) at P7–P9 to 14 ± 1.2 pA (n = 10) at P28–P30. The frequency of occurrence of sIPSCs was highly variable among different cells but this was not investigated in detail, although in cells from younger animals sIPSCs occurred at a clearly higher frequency. As previously reported, TTX (1 μm) strongly depressed the frequency of occurrence of sIPSCs in granule neurons (Puia et al., 1994) and therefore could not be used to investigate miniature sIPSCs. In every granule cell studied at different developmental ages, sIPSCs had a fast rising time (less then 1 msec) followed by a double-exponential decay (Fig. 1B). The average fractional contribution to sIPSC peak amplitude of the fast decay component was variable among cerebellar granule cells at different postnatal groups. In Figure 1C the mean of the average fractional contribution of the fast decay is reported for five distinct postnatal day groups. A statistically significant developmental increase can be observed; however, we believed that an appealing, although arbitrary, representation of these data were to identify three major cell groups according to the relative fractional contribution to peak sIPSC of the fast decay component (%Fast). Those three groups consisted of a “fast” group with %Fast being greater than 70%, a slow group with %Fast less than 40% and an intermediate group comprising all other cells. The fast and slow time constants were not significantly different among these distinct groups and were similar to those reported previously (Puia et al., 1994; fast time constant range 3–9 msec; slow time constant range 30–70 msec). When the relative proportion of cells belonging to these groups is displayed as a function of postnatal age, we observed a clear reduction in the number of “slow” and “intermediate” cells and an increase in the number of “fast” cells (Fig. 1D). Lastly, in light of the reported alteration of sIPSC kinetics by phosphorylation described by Jones and Westbrook (1994, 1995b), we studied the effects of substitution of ATP-γ-S for ATP in our intracellular solution. In nine neurons at P9, recording for up to 35 min in the presence of ATP-γ-S in the pipette solution failed to reveal significant changes in the sIPSCs exponential decay time constants and %Fast (τf 6.8 ± 3; τs 48 ± 7, %Fast 28 ± 8 at the beginning of the recording and τf 6.2 ± 3, τs 44 ± 11, and %Fast 24 ± 5 after 35 min). To characterize the relative contribution of α subunits of GABAA receptors in inhibitory synapses of rat cerebellar granule cells during development, we used furosemide to selectively inhibit α6 subunit-containing GABAAreceptor subytpes (Korpi et al., 1995). In rats younger than P10, we failed to observe a decrease in the average sIPSC amplitude by furosemide (100 μm) in most cells studied, whereas in rats at P10 through P24, we observed an average reduction of 15% (Fig. 2) in the same parameter. However, when furosemide was applied to sIPSCs from granule cells (n = 11) from rats at P29 to P30, a statistically significant greater inhibition was observed with an average of 33 ± 6% (Fig. 2). At all postnatal ages, we observed a highly variable inhibition among distinct granule cells; with some cells the inhibition of sIPSC amplitude was greater whereas few cells were found in which sIPSCs were not affected at all. As can be observed in Figure 2B, the proportion of cells with sIPSCs insensitive to furosemide decreased considerably by P30. 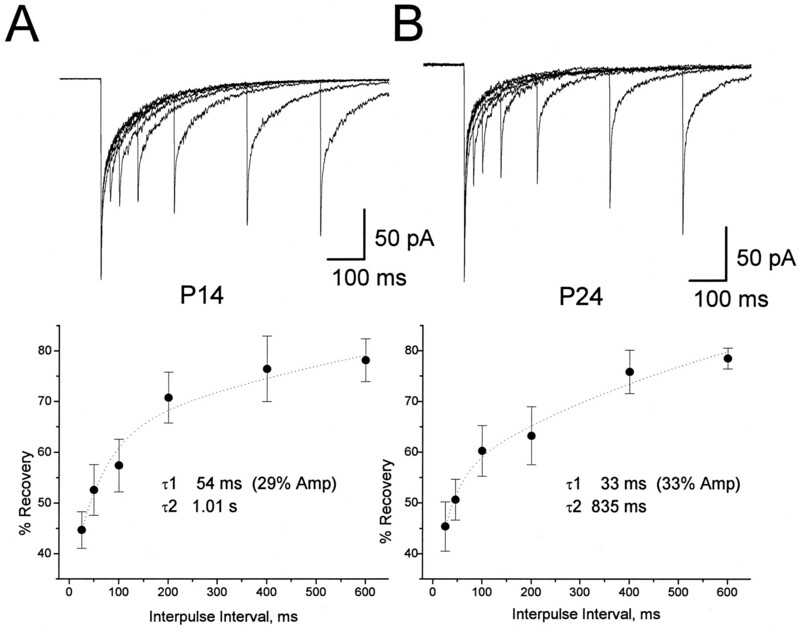 Furosemide did not significantly decrease sIPSC amplitude in four out of five neurons with “slow” decay kinetics at P8–P9, whereas it significantly decreased sIPSC amplitude in all the six “fast” decaying neurons investigated at P29–P30. However, when all cells studied at various ages were pooled, furosemide was equally effective in reducing sIPSC amplitude in the three kinetic groups (8/14 slow, 11/17 fast, 21/29 inter). Lastly, furosemide did not alter significantly the average %Fast of sIPSCs at all ages considered, although it decreased the fast decay time constant in a few neurons. Kinetic parameter of sIPSCs at all ages considered were τf 7.2 ± 2, τs 53 ± 2, %Fast 60 ± 4 before furosemide and τf 4.4 ± 1, τs 59 ± 3, and %Fast 59 ± 4 after furosemide. Purkinje neurons do not express the α6 subunit of GABAA receptors. sIPSCs in Purkinje neurons were therefore investigated for comparison with granule neurons. In Purkinje neurons, high frequency occurrence of sIPSCs occurred at all ages tested, and it generates multiple overlapping inward currents (Fig. 3). This fact prevented reliable measurement of average sIPSC peak amplitude. We bypassed the problem by evaluating the charge transfer (integral of the current) in equal time intervals of recording as shown in Figure 3 (see Materials and Methods). Furosemide is also known to act on the Cl− transporter (Misgeld et al., 1986), although at concentrations higher than those used in the present work. We therefore investigated the effects of furosemide (100 μm) on sIPSCs from Purkinje neurons using both a low Cl− (Cs-methanesulfonate as main salt), as well as symmetrical Cl− solution in the patch pipette (CsCl as main salt). With CsCl in the recording solution, 100 μm furosemide produced a 17 ± 30% increase of the sIPSCs current integral (n = 4 cells) whereas when using Cs-methanesulfonate contained in the pipette, we observed a decrease of 7 ± 12% of the same parameter (n = 4 cells). In both experimental conditions the variation was not statistically different from baseline (one population t test, p < 0.05). To determine whether sIPSCs decay kinetic changes are related to the intrinsic properties of the GABAA receptor, we attempted to mimic synaptic transmission by applying GABA pulses to outside-out nucleated patches and we studied the GABACs produced. As previously reported, (Puia et al., 1994), the fast application of brief pulses of GABA at a 1 mm concentration in extracellular solution combined with TTX (1 μm) elicited Cl− currents (GABACs) with a fast rise time (typically less than 1 msec) and a rapid double-exponential decay that resembled the sIPSCs. When the %Fast of GABACs was compared (Fig.4) between GABACs activated by pulses (1 msec duration,) versus steps (>100 msec) of GABA application, the fast time constant and the %Fast were similar in most patches examined, in three age groups (Table 1). As observed for sIPSCs, nucleated patches excised from granule neurons could be grouped according to the %Fast of the averaged GABACs. 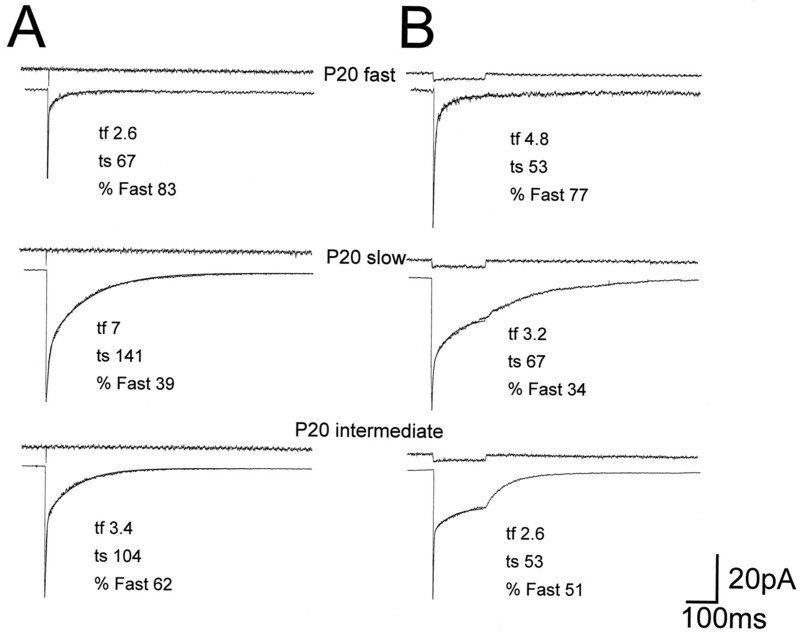 In 12 granule neurons at P8–P10, we observed 25% “fast,” 33% “slow,” and 42% “intermediate” nucleated patches whereas in the 29 neurons at P20–P24, we observed 23% “fast,” 4% “slow,” and 73% “intermediate” nucleated patches. A comparison of inward currents elicited by rapid applications of GABA (1 mm) on nucleated outside-out patches excised from granule neurons. In three nucleated patches excised from cerebellar granule neurons at P20, double-exponential fitting of the GABAC decay time revealed distinct fractional contribution of the fast exponential decay to the peak current. P20 fast, P20 slow, and P20 intermediate refer to the fractional contribution to sIPSCs peak amplitude measured before the excision of the nucleated patch (81, 37, and 63, respectively). In A is shown the average of 5–10 GABACs generated by 1 msec GABA applications and is compared inB with average GABACs generated by 150 msec applications on the same nucleated patch. Above each trace are shown the currents generated by the liquid junction potential caused by a 50:1 dilution of the GABA-containing solution measured after “blowing out” the patch, to give an indication of the duration of the pulse application. Calibration bars apply to all traces but not to the current pulse that had an amplitude of 4 pA. The kinetic parameters of the GABAC decay time are indicated to the right of each trace. We then compared the kinetics of sIPSCs with that of GABACs recorded in the same neurons in two distinct age groups (Table 1). In 21 granule neurons in rats younger than P15, we observed a good match between the %Fast for both sIPSCs and GABACs. However, when GABACs from 16 nucleated patches excised from granule neurons in rats older than P23 were compared to averaged sIPSCs we observed a significant difference in the %Fast. When the %Fast of GABACs was compared between the two age groups no significant differences were observed. However, significant differences were observed between the slow decay time constant of sIPSCs when compared to GABACs (Table 1). Paired pulses of GABA (1 mm, 1 msec) were given at variable intervals to nucleated patches excised from developing granule neurons. Figure 5 shows one example of such an experiment, with an indication of the recovery time constants. When we compared the kinetics of recovery from desensitization in nucleated patches excised from seven granule neurons at P14 with those recorded from four neurons at P24, we did not observe major differences in the biexponential recovery from desensitization, which was fairly variable between cells of the same age group (range 30–80 msec for the first time constant, and greater than 800 msec for the slowest recovery time constant). Paired-pulse applications of GABA in nucleated patches excised from granule cells. The averages of 5–10 GABAC pairs generated by 1 msec GABA applications at variable time intervals on nucleated patches excised form a granule neuron at P14 (A, top) and at P24 (B, top) are shown superimposed. In thebottom panels the percentage recovery from desensitization as a function of the interpulse interval is plotted for the two cells considered. These values were calculated from the difference between the peak responses and the onset of each GABACs at the start of the second response, similar to the procedure described by Jones and Westbrook (1995a). When furosemide (100 μm) was applied to outside-out nucleated patches at P20–P23, the extent of reduction in the peak amplitude of GABACs was less than that of averaged sIPSCs. In 12 granule cells at this postnatal age, furosemide caused a reduction in the peak GABACs of 9 ± 6.2%. This reduction was significantly different from the reduction of peak sIPSCs in whole-cell recordings at the same postnatal age (17 ± 6.6%). Kinetic parameters of GABACs in the 12 cells tested were τf 6.5 ± 1, τs 111 ± 9, %Fast 55 ± 3 before furosemide and τf 4.9 ± 1, τs 97 ± 5 and %Fast 61 ± 7 after furosemide. For comparison with sIPSCs and GABACs recorded from developing granule neurons, we studied furosemide action GABACs in outside-out patches excised from mammalian HEK293 cells transfected with distinct combinations of α1, α6, β2, and γ2 subunits (Fig.6). GABACs from transfected cells had fast and slow exponential decays similar to those recorded in granule cells. GABACs were elicited by rapid pulses (1 msec duration) of 1 mm GABA to outside-out patches or to small (less than 6 μm in diameter) transfected cells lifted from the bottom of the coverslip. These cells were identified by the presence of antibody-tagged magnetic beads. Both in outside-out patches and in small transfected cells the rise time was very fast, usually being close to 1 msec (see Materials and Methods). Furosemide inhibits GABA-activated currents in transfected cells expressing α6 subunits. A,Left, The average of 5–10 GABACs generated by 1 msec GABA pulse applications on small cells transfected with cDNA for distinct combination of α1β2γ2, α6β2γ2, α1α6β2γ2, and α1β2 GABAA receptor subunits is shown. Superimposed to each current trace are shown the biexponential fitting of GABAC decay. The kinetic parameters resulting from the fitting of the GABAC decay time course are τf 17 msec, τs 180 msec, %Fast 70 for the α1β2γ2 subunit combination; τf 70 msec, τs 213 msec, %Fast 90 for the α6β2γ2 subunit combination; and τf 9 msec, τs 395 msec, %Fast 80 for the α1α6β2γ2 subunit combination. Above each trace is shown the current pulse used to assess the duration of the pulse application. A,Right, The effect of furosemide (100 μm) on currents elicited by GABA (1 mm) on outside-out patches from transfected cells expressing recombinant GABAA receptors containing α1β2γ2 subunits (top) is compared with the effect of furosemide on receptors containing α6β2γ2 (middle) and α1α6β2γ2 (bottom) subunits. In the presence of furosemide, the kinetic parameters resulting from the fitting of the GABAC decay time course are τf 17 msec, τs 178 msec, %Fast 69 for the α1β2γ2 subunit combination; τf 41 msec, τs 313 msec, %Fast 88 for the α6β2γ2 subunit combination; and τf 9 msec, τs 345 msec, %Fast 83 for the α1α6β2γ2 subunit combination. B, The summary of the results on the percent inhibition by furosemide (100 μm) of the peak GABACs is shown for six distinct subunit combinations of recombinant GABAA receptors.Asterisks, Statistical significance with respect to the reduction observed in transfected cells with the α1β2γ2 cDNAs (p < 0.05 ANOVA followed by t test). The time constants of the exponential curves describing GABAC decays were not significantly different between recombinant receptors in the α1β2, the α1β2γ2, and the α1α6β2γ2 subunit transfections, whereas the %Fast of GABACs was greater for the α1β2 and the α1α6β2γ2 transfection as compared to α1β2γ2 (Tia et al., 1996). When compared with GABACs from developing granule neurons cells %Fast of GABACs for the α1β2 and the α1α6β2γ2 transfection was not significantly different with GABACs recorded from granule neurons in rats older than P20 (t test, p < 0.05). In contrast, %Fast of GABACs recorded from granule neurons in rats younger than P15 was not significantly different from that of GABACs derived from the α1β2γ2 transfection (t test, p < 0.05). GABACs on cells cotransfected with α6β2γ2 subunit cDNAs were characterized by a dominant fast decaying component, being significantly slower than that measured in GABACs recorded from all other subunit combinations tested (Tia et al., 1996), that did not match kinetics of GABACs recorded from native receptors in developing granule neurons at any age tested. In all transfected cells tested, we also investigated the effect of furosemide on GABACs to verify the expression of α6 subunit containing receptors and to support our proposal regarding the contribution of this subunit to the assembly and composition of GABAA receptors during cerebellar granule cell development. As shown in Figure 6, furosemide (100 μm) inhibited GABACs recorded in excised patches from mammalian HEK293 cells transfected with α6β2γ2 subunit cDNAs but not with α1β2γ2 subunit cDNAs. A summary of the results obtained with furosemide in transfected cells (8 cells with each subunit combination) is shown in Figure 6B. Furosemide caused a significant reduction of the peak GABACs only in cells cotransfected with the α6β2γ2 or α1α6β2γ2 subunit cDNAs (p < 0.05). The reduction of the peak GABACs observed in HEK293 cells transfected with α1α6β2γ2 subunit cDNAs (33.4 ± 8.2%) was not significantly different from the reduction of peak sIPSCs in whole-cell recordings at most postnatal ages (with the exception of the age group P7–P9). Furosemide decreased the fast decay time constant of GABACs by 30% for recombinant α6β2γ2 subunits containing GABAA receptors. We previously showed that sIPSC decay in cerebellar granule cells is biexponential with a %Fast that varied from cell to cell (Puia et al., 1994). In this study, we demonstrate a developmental increase in %Fast of sIPSCs. Recently, Jones and Westbrook (1995a) proposed that the biexponential decay of sIPSCs and GABACs is produced by a relatively fast entry in and exit from desensitized states. According to this model, we propose that during the sIPSCs in a granule neuron, the postsynaptic GABAA receptors briefly enter into a desensitized state and reopen to produce a prolonged decay time course. To verify these proposals we studied rapid applications of GABA to excised nucleated patches from developing granule neurons. “Fast,” “slow,” and “intermediate” decay kinetics were also found in GABACs in excised nucleated patches. When more complete desensitization was observed with step applications it coincided with larger %Fast of GABACs produced by pulse applications. This result suggests that sIPSC decay is determined by GABAAreceptor kinetics and that “fast” decaying sIPSCs as well as GABACs may be attributable to receptors endowed with larger desensitization rather than nondesensitizing receptors with a fast dissociation rate similar to what was observed with low affinity agonists such as β-alanine (Jones and Westbrook, 1995a) and taurine (G. Puia and S. Vicini, unpublished observations). Paired-pulse experiments also demonstrated that exit from desensitized state is slow and similar for cells at different developmental ages. IPSC kinetics can be modulated by altering GABAAreceptor desensitization through phosphorylation (Jones and Westbrook, 1994, 1995b). Thus, the changes in sIPSCs kinetics in the granule cells may be attributable to changes in receptor phosphorylation during development. In our study, however, ATP-γ-S substitution failed to alter sIPSC kinetics in “slow” neurons of P9 rats, indicating that increased phosphorylation failed to reproduce the developmental increase in %Fast. Further investigation with specific phosphatases will be necessary to verify if the faster kinetics of sIPSCs observed in older rats is related to phosphorylation, although as discussed below, the discrepancy between the slow decay time constant of sIPSCs and GABACs in native and recombinant receptors perhaps implies a role for phosphorylation (Jones and Westbrook, 1995b). The expression of specific GABAA receptor subunits with development may also account for changes in sIPSC decay if the GABAA receptor subtypes that may form have distinct kinetics. The extent of desensitization measured from GABACs evoked by step applications and the recovery from desensitization measured by paired-pulse experiments were highly variable from cell to cell but they were not significantly different at distinct developmental ages. When the %Fast of sIPSCs and GABACs recorded in the same granule cells were compared in rats younger than P15 we observed a good match whereas in older rats (>P23) the %Fast of sIPSCs is larger than that of GABACs. Presumably, nucleated patches correspond to somatic membranes containing purely extrasynaptic receptors; hence, the possibility exists that in young rats GABAA receptors at extrasynaptic and synaptic sites are homogeneous. On the other hand, in older rats, the extrasynaptic receptors may differ from synaptic receptors, possibly related to the presence of distinct receptor subunits as further supported by the weak inhibitory effects of furosemide on GABACs. In fact, immunocytochemical studies in adult rats indicate that both α1 and α6 subunits are present at synapses innervated by type II Golgi cell terminals in granule neuron dendrites whereas α6-subunit-containing GABAA receptors are not found at extrasynaptic sites (Baude et al., 1992). In some glomeruli in adult rats, GABAergic synapses exclusively contain α1 subunits, whereas at other synapses α1 and α6 subunits colocalize in postsynaptic receptors. Recent results with α6 subunit-specific antibodies validate this hypothesis (Nusser et al., 1995, 1996). To verify that the contribution of α6 subunit-containing GABAA receptors in inhibitory synapses of granule neurons increases with development, we studied inhibition of sIPSCs by furosemide, a diuretic selective antagonist of GABAA receptors containing α6 subunits (Korpi et al., 1995). We showed that this diuretic did not affect significantly sIPSC amplitudes until P10 implying that GABAA receptors containing an α6 subunit may not contribute to an inhibitory synapse before P10. This result matches the developmental expression pattern of the α6 subunit mRNA in the cerebellum (Bovolin et al., 1992; Laurie et al., 1992b; Zheng et al., 1993) and support the hypothesis of an increased contribution of the α6 subunit to inhibitory synapses. In our experiments, we could not use TTX because it abolished sIPSCs in older animals. Therefore, furosemide inhibition of sIPSCs could involve a presynaptic component, although to explain our results one must hypothesize an increased presynaptic action of the diuretic with development. Furthermore, the results obtained on GABACs from cells transfected with selected recombinant receptors support the proposal that the effects we observed are related to the increased expression of α6 subunits. Lastly, the possibility that the inhibitory effect of furosemide on sIPSCs in granule cells could be attributable to the diuretic action on Cl−/cation transporters is unlikely because furosemide failed to significantly inhibit sIPSC in Purkinje cells. Furosemide inhibition of sIPSCs indicates that the α6 subunit may also play a key role in developmental changes in the sIPSC decay observed. We therefore investigated the kinetics and furosemide sensitivity of GABACs in small transfected cells expressing recombinant GABAA receptors that include the α6 subunit. To understand the variable degree of inhibition of average sIPSC amplitude by furosemide in developing granule neurons, we needed to investigate the effect of coexpression of both α1 and α6 subunits. Our results showed that GABACs from recombinant GABAAreceptors in cells cotransfected with the α1α6β2γ2 subunit were less sensitive to furosemide inhibition than those cotransfected with the α6β2γ2 subunit combination. These data may indicate either that the cotransfection produces receptors containing both α1 and α6 subunits, together with β2γ2 subunits, or that distinct α1 and α6 subunit containing receptor populations are formed. In any case, the simultaneous presence of α1 and α6 subunit mRNA, such as that occurring in developing granule neurons, reduces furosemide inhibition. GABACs from transfected cells show a larger %Fast with the α1α6β2γ2 and the α1β2 subunit combination with respect to the α1β2γ2 subunit combination, and a much slower fast time constant for the α6β2γ2 subunit combination (Tia et al., 1996). Because the kinetics of furosemide sensitive GABACs from cells cotransfected with α1 and α6 subunit cDNAs were distinct from those of cells cotransfected with α1 or α6 subunit, one may assume that the coassembly of these subunits in GABAAreceptors takes place (Tia et al., 1996). It is appealing to speculate that the fast decaying sIPSCs described in older rats, are the result of postsynaptic GABAA receptors coexpressing α1α6 subunits. Alternative possibilities should also be considered, such as the formation of postsynaptic receptors lacking the γ2 subunit, although molecular biological studies clearly indicate a developmental increase rather than a decline of the mRNA level for this subunit (Bovolin et al., 1992; Laurie et al., 1992b; Zheng et al., 1993). Also, cerebellar granule cells express relatively high levels of δ subunit at P20 but not at P10 (Muller et al., 1994), so the presence of this subunit in postsynaptic GABAAreceptors may underlie some changes in sIPSC kinetics. To distinguish between these possibilities, further experiments with recombinant receptors are needed. Whereas we are currently determining the extent of desensitization with various recombinant receptors in search of a match for the strongly desensitizing GABACs measured with step applications in “fast” granule neurons, the possibility exists that mechanisms alternative to subunit composition may be responsible for these large desensitizing responses. For example, the increase in the extracellular GABA concentration observed with development, if present at the synaptic cleft, may influence the kinetics of the sIPSCs by altering GABAA receptor desensitization. Furthermore, the significant differences between the slow time constant of sIPSCs and those of GABACs from both native and recombinant receptors imply that some other factor is operative in determining sIPSCs decay, possibly receptor phosphorylation (Jones and Westbrook, 1995b). Concerning the molecular basis for the slow component of sIPSCs decay in cerebellar granule neurons there are additional unanswered questions. Our results on GABACs from recombinant receptors indicate that this is not related to the presence of the α6 subunit because it can be observed with α1β2γ2 recombinant GABAA receptors and it is insensitive to furosemide inhibition. However, because the decay of GABACs α6β2γ2 subunit containing receptors is slower than that of any recombinant receptor tested (Tia et al., 1996), the possibility exists that at least in some granule neurons, slow sIPSC decay may be related to the presence of receptors expressing this subunit combination. As widely speculated, the cerebellum is deeply involved in the learning of motor skills. The inhibitory synapses between Golgi cells and granule cells can suppress the excitation of granule cells by mossy fiber inputs and curtail the duration of excitation, ultimately modulating Purkinje cells, the major cerebellar cortical output. At P14, a rat opens its eyes and starts moving around, suggesting an extensive postnatal development of motor control, coordination and learning. From our study, at this developmental age, a significant change in the decay time course of the granule cells sIPSCs is found that may be related to the increased α6 subunit contribution to postsynaptic receptors in cerebellar glomeruli. It has been suggested that GABAA receptors containing the α6 subunit are functionally involved in cerebellar motor control (Korpi et al., 1993). It is possible that the changes in sIPSC kinetics we report might relate to motor learning. This work was supported by National Institute of Neurological Disorders and Stroke Grants R01 NS32759 and K04 NS01680. We are grateful to Dr. Karl E. Krueger and Dr. Dennis R. Grayson for critical reading of this manuscript. GABAA receptor subunit expression vectors were kindly provided by Dr. Peter H. Seeburg, Center for Molecular Biology, University of Heidelberg, Germany, and pRSV.IL2R was a gift of Dr. Anna T. Riegel, Department of Pharmacology, Georgetown University. Correspondence should be addressed to Dr. Stefano Vicini, Department of Physiology and Biophysics, Georgetown University School of Medicine, 3900 Reservoir Road NW, Washington, DC 20007. (1992) Differential subcellular distribution of the α6 subunit versus the α1 and β2/3 subunits of the GABAA/benzodiazepine receptor complex in granule cells of the cerebellar cortex. Neuroscience 51:739–748. (1992) Distinct developmental patterns of expression of rat α1, α5, γ2S, and γ2L γ-aminobutyric acidA receptor subunit mRNAs in vivo and in vitro . J Neurochem 59:62–72. (1991) Excitatory amino acid receptor-channels in Purkinje cells in thin cerebellar slices. Proc R Soc Lond [Biol] 244:179–184. (1992) Five subtypes of type A gamma-aminobutyric acid receptors identified in neurons by double and triple immunofluorescence staining with subunit specific antibodies. Proc Natl Acad Sci USA 89:6726–6730. (1994) Switch in the expression of rat GABAA-receptor subtypes during postnatal development: an immunohistochemical study. J Neurosci 14:5302–5324. 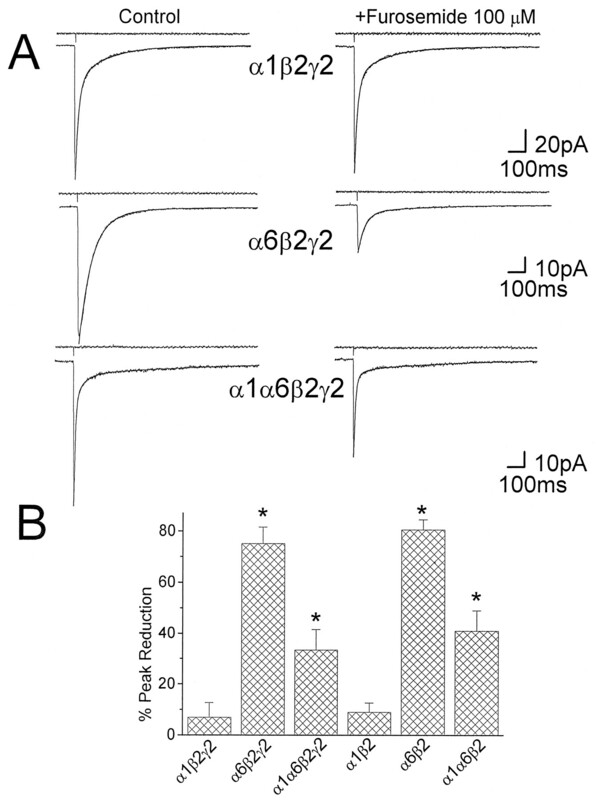 (1994) Altering GABAA channels desensitization shortens IPSC duration. Biophys J 68:A2. (1995a) Desensitization states prolong GABAA channels responses to brief agonist pulses. Neuron 15:181–191. (1995b) Phosphatase inhibitors shorten IPSC decay by altering GABAA kinetics. Soc Neurosci Abstr 723:12. (1995) GABAA/benzodiazepine receptor heterogeneity: neurophysiological implications. Neuropharmacology 34:245–254. (1993) Benzodiazepine-induced motor impairment linked to point mutation in cerebellar GABAA receptor. Nature 361:356–359. (1995) Selective antagonist for the cerebellar granule cell-specific gamma-aminobutyric acid type A receptor. Mol Pharmacol 47:283–289. (1992a) The distribution of 13 GABAA receptor subunit mRNAs in the rat brain. II. Olfactory bulb and cerebellum. J Neurosci 12:1063–1076. (1992b) The distribution of thirteen GABAA receptor subunit mRNAs in the rat brain. III. Embryonic and postnatal development. J Neurosci 12:4151–4172. (1994) How quickly can GABAA receptors open? Neuron 12:61–71. (1986) The role of chloride transport in postsynaptic inhibition of hippocampal neurons. Science 232:1413–1415. (1994) Developmental regulation of voltage-gated K+ channel and GABAAreceptor expression in Bergmann glial cells. J Neurosci 14:2503–2514. (1995) Relative densities of synaptic and extrasynaptic GABAA receptors on cerebellar granule cells as determined by a quantitative immunogold method. J Neurosci 15:2948–2960. (1996) The α6 subunit of the GABAA receptor is concentrated in both inhibitory and excitatory synapses on cerebellar granule cells. J Neurosci 16:103–114. (1992) Differential and transient expression of the GABAA receptor α subunit mRNA in the developing rat CNS. J Neurosci 12:2888–2900. (1994) Functional diversity of GABA-activated Cl− currents in Purkinje versus granule neurons in rat cerebellar slices. Neuron 12:117–126. Tia S, Wang JF, Kotchabhakdi N, Vicini S (1996) Distinct deactivation and desensitization kinetics of recombinant GABAA receptors. Neuropharmacology, in press. (1992) Mapping of GABAA receptor α5, α6 subunit-like immunoreactivity in rat brain. Neurosci Lett 144:53–56. (1994) Formation of heteromeric γ-aminobutyric acidA receptors containing two different α subunits. Mol Pharmacol 45:475–480. (1992) Inhibitory synaptic currents in rat cerebellar Purkinje cells: modulation by postsynaptic depolarization. J Physiol (Lond) 456:453–471. (1995) Deciphering the native GABAA receptor: is there hope? J Neurosci Res 41:567–571. (1993) Developmental expression of the α6 GABAA receptor occurs only after cerebellar granule cell migration. Brain Res Dev Brain Res 75:91–103.